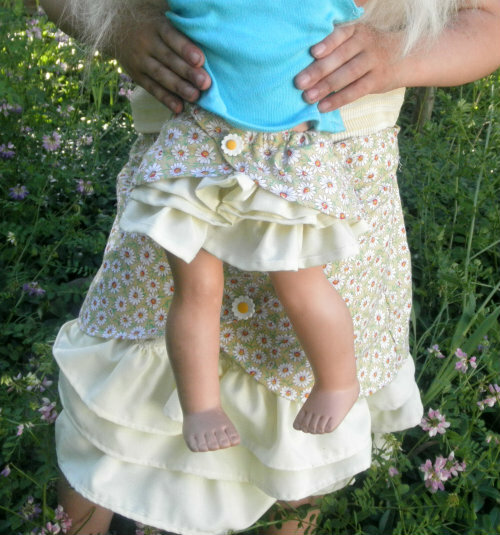 The girl and doll skirts seen in yesterday’s post were made using two different patterns. They were designed by two different designers and sold by two different companies, and follow completely different construction techniques. But when finished they look exactly the same. Liberty Jane sells a collection of doll clothes patterns from a variety of designers. Most of whom also sell their finished work. Sew Urban is the designer of the Savannah skirt that we will be using today. Violette Field Threads is a pattern company owned and operated by two best friends, specializing in boutique style children’s clothing patterns. The designed the Vivienne skirt. After sewing both patterns Savannah appears to be a mini me of Vivienne, but on closer inspection you see how unique each skirt really is. I’ll start with the overskirt, since it is the first thing you see. Vivienne - The front of the over skirt is self-lined which makes for a beautiful polished finish but adds to the most significant problem with the pattern - the bulk in the waistband, especially after the flaps are overlapped. The back of the overskirt is a single layer of fabric that is hemmed and then attached to the front at the side seams. Savannah - The over skirt uses 4 pattern pieces, 2 for the front and two for the back creating a center back seam that we don’t see in the Vivienne pattern. All four pieces are sewn together and then hemmed as one piece. The only construction detail these patterns have in common is the ruffles. Both use a narrow hem and a row of ruffle stitches on the top. Pretty Slandered Stuff. The similarities ended when it was time to attach the ruffles to the underskirt. Vivienne – To make the underskirt the front and back are sewn together at one side seam and then hemmed. The ruffles are then pinned and sewn in place across the length of the underskirt before being sewn together at the other side seam. This does add a tiny bit of bulk to one side seam that you don’t see in the other. After the overskirt is attached it won’t be noticeable. Savannah - Each ruffle is first sewn onto a strip of fabric, Then the strips of fabric are sewn together crating the under skirt. The skirt is then sewn together at the center back seam. I’m still not a fan of the ruffles being sewn into the seam, but it does look a little bit more natural than having them sewn into only one side seam. Vivienne – The underskirt is attached and then flipped to the inside. A row of stitching creates the elastic casing. The waistband in the front is way too thick to insert elastic. Perhaps that is why the elastic is only inserted into the back of the skirt, or maybe it is to give the front a smoother finish. Either way it does affect the fit a little bit. 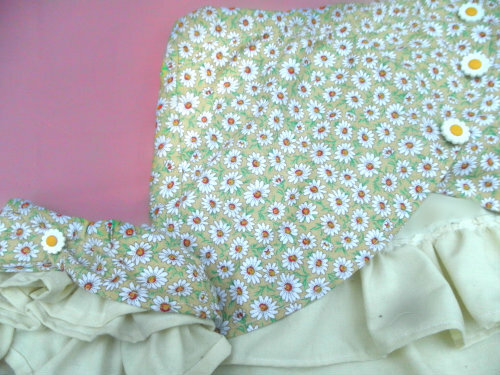 The skirt will sag a little in the front if you don’t get the elastic tight enough in the back. 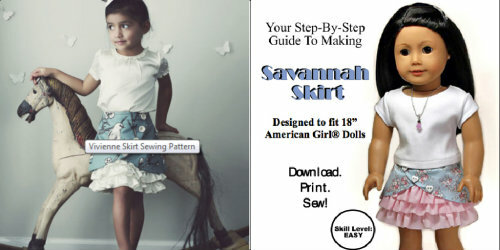 Savannah – A similar method is used for attaching the underskirt, but with only a single layer for the front flaps there is slightly less bulk. Elastic is inserted all the way around. It is still a bit of a challenge to get it past the seams but I managed. I learned more about sewing while making to matching skirts from different patterns, than I ever could have learned from sewing either one of these skirts alone. If I were to sew the Vivienne skirt again I would incorporate a couple of the techniques form the Savanna skirt. I hope you enjoyed my comparison of these to patterns. 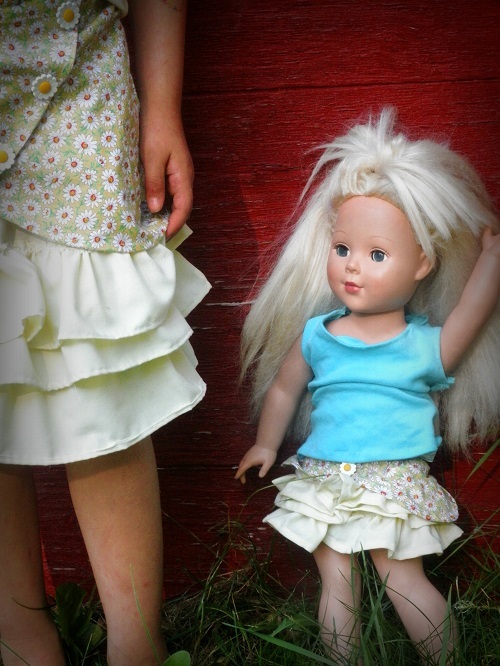 Don’t forget to subscribe to see more sewing projects for the whole family, including the dolls.